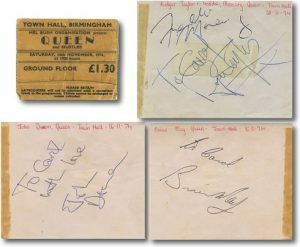 Queen Autographs and Autograph Examples | Freddie Mercury, Brian May, Roger Taylor, and John Deacon. A British rock band Queen formed in London in 1970. 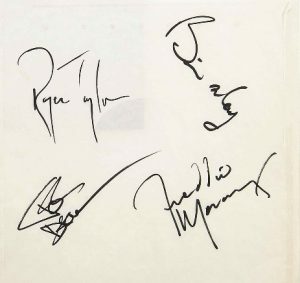 Their classic line-up was Freddie Mercury (lead vocals and piano), Brian May (lead guitar and vocals), Roger Taylor (drums and vocals), and John Deacon (bass guitar). Their earliest works were influenced by progressive rock, hard rock, and heavy metal, but the band gradually ventured into more conventional and radio-friendly works by incorporating further styles, such as arena rock and pop rock. Before forming Queen autographs, May and Taylor had played together in the band Smile. Mercury was a fan of Smile and encouraged them to experiment with more elaborate stage and recording techniques. He joined in 1970 and suggested the name “Queen”. Deacon, recruited before the band recorded their eponymous debut album in 1973. 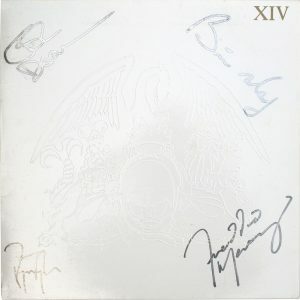 Queen first charted in the UK with their second album, Queen II, in 1974. Sheer Heart Attack later that year and A Night at the Opera in 1975 brought them international success. The latter featured “Bohemian Rhapsody”, which stayed at number one in the UK for nine weeks and helped popularise the music video. Estimates of Queen’s record sales range from 170 million to 300 million records; making them one of the world’s best-selling music artists. 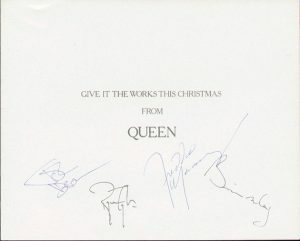 Additionally, Queen received the Outstanding Contribution to British Music Award in 1990. Also, They Queen inducted into the Rock and Roll Hall of Fame in 2001. Furthermore, Each member has composed hit singles, and all four inducted into the Songwriters Hall of Fame in 2003. 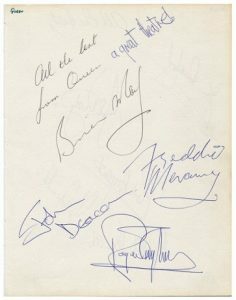 In 2005, Queen autographs received the Ivor Novello Award for Outstanding Song Collection from the British Academy of Songwriters, Composers, and Authors.